Mergenthaler Linotype, in the United States, was founded in Brooklyn, but later moved to Melville, NY, and then to Hauppauge, NY. Mergenthaler Linotype’s design studio employed at varying times up to 80 designers under the direction of Chauncey H. Griffith, Jackson Burke, Mike Parker, and Matthew Carter. In continental Europe, Linotype typefaces were produced by the D. Stempel AG typefoundry in Frankfurt, Germany. Stempel’s design studio would employ up to 50 designers under the direction of Hermann Zapf, Gotthard de Beauclair, Erich Schulz-Anker, Horst Heiderhoff, and Werner Schimpf. 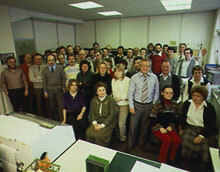 After Linotype’s acquisition of D. Stempel AG in 1985, their type production and design teams moved to Eschborn, Germany, just outside of Frankfurt. In the UK, the English Linotype Ltd designed and produced Non-Latin typefaces for Arabic, Hebrew, Thai, Indic languages, etc. under Walter Tracy, and later under Fiona Ross. Typefaces whose design is credited to the Linotype Design Studio were created in-house by various departments – or partners – throughout Linotype’s history. Often, these typefaces were designed, redesigned, and/or extended by teams of staff members, and attribution to single persons is therefore not possible. Linotype’s in-house departments included production teams at the American, British, and German Linotypes, as well as Tetterode in the Netherlands, Deberny & Peignot and the Olive typefoundries in France, Haas´sche Schriftgiesserei (Haas Type Foundry) in Switzerland, and at the Dr.-Ing Rudolf Hell GmbH and D. Stempel AG in Germany?the latter’s work included many typefaces that originally appeared with the Klingspor and/or other foundries. The Linotype Design Studio’s name and tradition have been associated with some of highest quality and most possible typefaces produced during the hot metal, photo-typesetting, and digital eras. This tradition lives on today. Since 1997, all work Linotype Design Studio has been developed at Linotype GmbH’s office in Bad Homburg, Germany. Topografische Zahlentafel is a trademark of Monotype GmbH and may be registered in certain jurisdictions.